Millenials are not easily sold with news and ideas fed to people by corporations and the mainstream media, because they prefer hard questions being asked, Tyrel Ventura, a host of RT America’s new show Watching the Hawks, told Larry King’s Politicking. King caught up with the crew of the show who say they are trying to make Americans think outside the box. 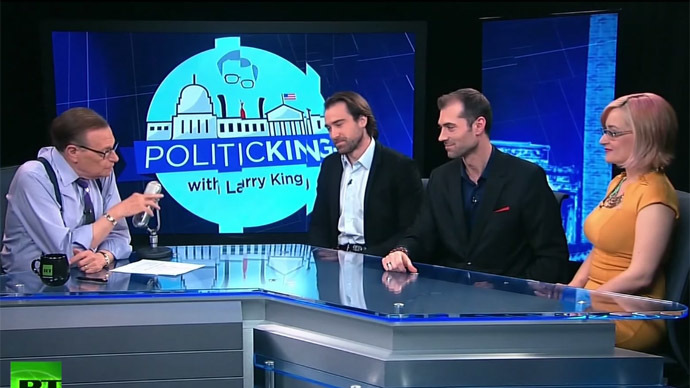 Larry King: A trio making up a new generation of co-hosts for a current events and news talk show hits the airwaves promising to give viewers a seldom seen perspective to those who fall somewhere between the war hawks and the isolationists. The show is hosted by Tyrel Ventura, Sean Stone and Tabetha Wallace, and we’re here at the beautiful RT studios in Washington DC. So you are the sons of famous people, your father was Oliver Stone, the famous director. King: Your father is Jesse Ventura, former governor of Minnesota, who’s half time in Mexico and he also hosts his own show on Ora TV. And do you have a famous father? Tabetha Wallace: My father was a janitor at a grade school for 30 years. King: The one successful person on this show. Now all of you are former co-hosts of Buzzsaw. So explain this transition from Buzzsaw to the new show, Watching the Hawks. Stone: I’ll talk about it a little bit because I’m still hosting Buzzsaw online, which is an online news show that these fair people started with me two years ago. And they were hosting the news segment and I was doing the interview section. So they basically came to work for RT about a year ago and that’s the point that I kept going with the interview side of Buzzsaw, so they can talk about what they’ve been doing here at RT preparing this. Tyrell Ventura: Buzzsaw kind of came out of what me and Sean were working on Conspiracy Theory…and we got the opportunity to create a show online on the success of that show and bring Tabetha in. And that fantastic trio that we made doing that show, the success of that show got us over here to RT. Me and Tabetha had been news producing and creating content on RT, we co-hosted a segment on the daily news show called Press the Media where we went after the mainstream media and called them out for any kind of wrong statements or if they weren’t talking about a story correctly or things of that nature, and away we went. And in the process of that was when RT looked at the dynamic of three of us together and they said this could really make a great daily show. King: And why the title Watching the Hawks? Wallace: Most people know the term war hawks. King: You don’t watch the doves? Wallace: No we love them. We don’t need to keep an eye on them. The War Hawks and hawks were kind of a group of generations which had been sold to. We are sold to probably more than any generation before us with all of the media and so someone is always hawking their wares at us, whether its big business or corporations or its war hawks. And even news hawks now – you have this media that is sort of selling to us and selling to us. And no one is really taking a step back and looking at what effect that has on us. We don’t want to be sold into a political party. We don’t want to be sold into something. We want to have a conversation and we are not seeing that anywhere else now. So we’re trying to keep an eye on it. Stone: I’ve been a revolutionary since 1984, the year I was born. That’s kind of my lineage for sure as you mentioned. Going back to films like The Doors about Jim Morrison, JFK, even his films about the Vietnam War. He is considered a political filmmaker. King: Did he steer you this way? Stone: I don’t think he directly steered me to this course but he definitely opened my eyes in many ways since I would say being a high school teenager, reading history with him. I would show him my textbooks and he would say: “Ah, you know that’s hogwash, read this book.” And a lot of that conversation ended up as part of his Untold History of the United States series, which he did for Showtime. King: Your father raised you to be independent? Ventura: Yes he raised me to be independent, and he raised me to never be afraid to ask questions. That there is no such thing as a stupid question and to always question authority or question history in much the same way. The funny connection there, is that when I was probably 11 or 12, and when the movie came out, he took me to go and see JFK in a similar fashion like, “Look, they’re teaching you this one element of it at high school, the killing of Kennedy. I want you to see another aspect of it.” It opened my mind up to the fact that in our history books we’re generally not told the full story. King: So you were raised to think conspiratorial? King: I looked it up in the dictionary and got a picture of your father. Ventura: The idea of conspiracy theorist and all that to me is always a little bit wacky, because when you look at power structures – people get together throughout history to break the laws or meet their own needs, whether it be through money or influence, to push their own agenda, and that’s first politics, that’s just regular government. And so the idea of “conspiracy theorist” and that kind of thing I think has been turned into this ugly term when in truth its simply just asking questions, searching for the truth. And there’s nothing wrong my dad inspired the hell a lot of that. King: Were you born in a revolutionary household? Wallace: No, not really. Very blue-collar, typical working-class family. King: So what drew you to broadcasting? Wallace: I’ve always been a writer. I worked at Newsweek in 2002 and it definitely left an impact on me. I went into media and worked at Miramax for a couple of years in the movie industry and then in movie marketing, which teaches you how to sell things to everybody. And then eventually as things happened in 2008 it became something that was far more important than making movies. King: Is this show, Sean, aimed at millennials? Stone: I think that’s part of the attraction of having young news commentators, because you look around at most of the networks and there is this realization of “wait a minute, we’re losing the young audience, so how do we appeal to them?” Maybe we need to find some young voices who have a different perspective on everything from the political process to world geopolitics. King: Do millenials watch the news? Ventura: I think they would if they thought the news would ask the hard questions. And I think there are very few programs out there that millennials can [watch]. When you look at it, they weren’t born where they lost a certain blindness or patriotism or whatever you might call it. They were born with the cynicism, they were born knowing, after Watergate and after all these events, when they could very easily see that the government doesn’t tell them the whole truth at times or corporations, like Tabetha said, are constantly marketing to them and telling them you’re ugly or whatever just to get them to buy a product. So they’re born with a certain amount of questioning and you don’t see that as much. CNN to me just feels like the official mouth of the State Department, no matter who is in power. And then Fox plays to its right-wing base... I think the millennials as a whole don’t want to fall in and don’t want to be categorized to certain specific groups, they want to do their own independent thinking. King: Give me the format of watching the Hawks, what do I see when I watch it? King: The three of you sitting here, you are all on camera together? Wallace: And we will go through a news story and give as much of the facts and context... I think context is a really important thing educating people about what the broader picture is and then looking at a specific news item. And then we see it from all of our perspectives. We don’t always agree on things, we have always naturally been people who can disagree and still have a conversation and walk out learning more about each other and about the world, and we’re trying to bring a little bit of that what we have naturally to the air instead of everybody yelling at each other. King: The show is at 6 o’clock Eastern Time, is an hour or half an hour? King: So one of you is a host or you’re co-hosts? Ventura: All of us are hosts, I guess I lead it off every night, so I guess you could call me the ringmaster, so to speak. But the great thing about what Tabetha was talking about, the great thing is that we do have these each individual identity voices. So Tabetha didn’t come from the same background that me and Sean came from. I didn’t go to Princeton or Oxford where Sean did. So we each have these really different perspectives, and I think the importance of those perspectives is what is kind of a lost today when you see other shows, when it’s just one host. King: You went to Princeton and Oxford? Stone: I did, I was a Princeton graduate, I went to Oxford for an exchange for a semester. You don’t see ISIS, al-Shabaab as enemies? Stone: That’s a long question because obviously the question is, how direct is ISIS, as an enemy, to the United States, for example? Are they perhaps a threat to humanity in that region? Undoubtedly. They are extreme, radical people. But as an enemy of the United States of America, how dangerous are they to us? I don’t see them as a tremendous threat. Stone: Well, who was arming Hitler at the time, though? As a historian we look at those questions: why is the British Empire allowing Hitler to rearm? Why are the US corporations – Standard Oil, Ford Motors, DuPont Corp. – why are these corporations basically helping Hitler to rearm and expand his empire? You don’t get arms and weapons from nothing. So that’s what I look at, the financing and the angle of who is actually facilitating the warmongers. And that’s oftentimes is overlook as the idea who’s actually financing these people as opposed to… those questions. King: Well what do you do when they are reality? Let’s say the British financed Hitler. You had to go to war with him. Ventura: Yes, at a certain point I believe if there is truly a direct threat to the US, and when you look at situations like a growing threat there, you have to change people through their culture. Dropping bombs on people doesn’t necessarily prevent it. There are cases in history where outright war has worked, of course, but ultimately if you want to truly change a culture, you have to build the culture up around them that allow those people in that region to have the strength and the want to get rid of something like ISIS. If we go in and start dropping bombs on ISIS, all we’re going to be doing is potentially killing other civilians, which then bolsters their cause. Because, ultimately, ISIS wants us to come in and be that outside Western power so it justifies their belief system. There are better ways to fight a group like ISIS than just going over and laying waste to the region again, which we’ve done now for the last 15-some-odd years. King: Do you feel, Tabetha, when you have these views, which could be labeled progressive – all of you I’d call progressives – that you’re fighting windmills? Wallace: Yeah, because sometimes you’re trying to have a conversation about what’s going on – if it’s drone strikes or it’s our military operations – when you’re trying to just get facts and trying to say, “Is there a better way that we can do this that won’t cost so much human life?” You’re immediately labeled this: “Well you’re a liberal, you’re a progressive.” You’re fighting that stereotype that’s being put in place and nobody’s really talking about what’s happening to people and what’s the future of that. We’ve been through war after war, and it seems like we should be a little bit better at protecting people without losing so many lives and losing so much history and so much heart in who we are in order to do it. King: You converted to Islam, did you not, Sean? Stone: I accepted Islam, because I feel that Islam is an extension of Judeo-Christian culture, which most people don’t understand. They look at Islam as a foreign entity as opposed to an outgrowth of the Jewish texts, of the Christian religion, of Islam actually accepting Christ as the Messiah. All these factors I looked at and said, actually, I think Mohammed was a prophet in that lineage, so when I accept Mohammed as a prophet that makes me Muslim. Many people miss that point by saying Islam is a foreign religion that’s sort of an antithesis, but it’s really not. Stone: I don’t feel any particular dislike. I don’t like terrorism in general, but I also would argue that terrorism is many types of different warfare, even if it is being launched by American drone planes or bombers that kill civilians. What is terror ultimately? It is the destruction of human life en masse without regard to the consequence of what you are creating as Tyrel talked about. When you bomb civilians, you create the ISIS situation in Iraq when you destroy their infrastructure and all of a sudden turn a lot of Sunnis and Shias against each other at a time when they were formally living in peace – and you create these ISIS groups. So terrorism is often created by war, which is terror. King: Don’t you think Tyrel that America’s virtues are well-grounded? We have of course made mistakes, but the concept of the Constitution is a pretty good one. Ventura: It’s an amazing one. I consider any time that you speak out for your beliefs, which this country has an amazing constitution that allows us to do that. And we are seeing that taken away more – but I think it is worth fighting for. That is why we do what we do and that is why we speak out because it should be that every voice should be heard and every voice should have a say. It’s a beautiful country. King: The co-hosts of “Watching the Hawks,” Tyrel Ventura, Sean Stone and Tabetha Wallace. Check out the show on RT America Monday through Thursdays at 6 Eastern.